On Saturday, June 13th, Prince Carl Philip of Sweden will marry Sofia Hellqvist in a lavish ceremony to be remembered for the ages (because if there’s one thing we know about Swedes, it’s that they like to party and also Ace of Base). What better way to celebrate than by looking at the beautiful dresses all of us want—yes, all of us—but will probably never be able to afford? 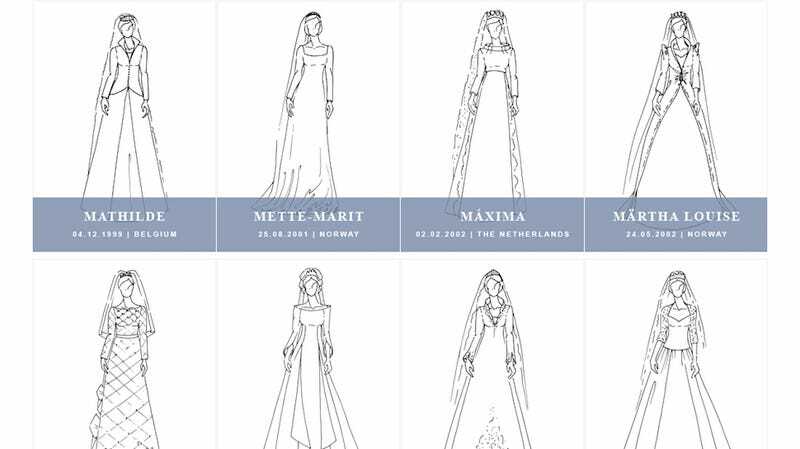 Zalando has created an infographic of all the beautiful wedding gowns worn by royals in the past 100 years. An interactive version of which can be found on Zalando’s site and features all sorts of important information on designers and what sort of exorbitant fabrics were involved. The site doesn’t feature information on why Camilla Parker Bowles’ double-whammy was excluded from the graphic, but I’m going to assume it was some kind of drama–that stuff follows Camilla everywhere. Which one is your favorite? Which one is most hideous? I love Kate’s and hate Diana’s. Is that a crime? It’s probably a crime. Mabel’s is also particularly i-n-t-e-r-e-s-t-i-n-g. Does it look like Quilted Northern to anyone else? No, just me?